The Cottages of Atlantic Beach community in Atlantic Beach, Florida. 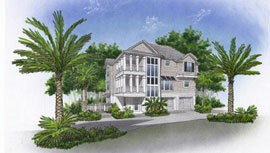 The Cottages of Atlantic Beach is a community inspired by the small, waterfront towns of the eastern seaboard. Located on the east side of Atlantic Beach, between Seminole and Beach Avenue, the Cottages of Atlantic Beach offers seven beach residences with attached two car garages. The architectural points of the buildings feature deep eaves, shuttered accents, and hipped roofs. The homes feature an entry porch and second and third level porches. High ceilings allow sea breezes to circulate and open balconies offer space to appreciate the sounds of the surf. The Cottages of Atlantic Beach feature homes with three to five bedrooms and a wide range of floor plans. Interior features include 9 to 10 ft. ceilings, insulated concrete walls, recess lighting, hardwood/tile and carpet floors, energy-efficient dual pane windows, community gas connections, and pre-wiring for cable. Enjoy the beach lifestyle of fun, sun, ocean breezes, and the sound of crashing waves. Atlantic Beach offers the best of Florida living with miles of white sandy beaches and mild seasonal changes. Three expressways provide easy access to Jacksonville for business, shopping and entertainment. Friendly, laid-back lifestyle where standard attire is shorts, sandals and a smile. Semi-tropical climate with breezy summers, pleasant winters, perfect springs and falls. For a private tour and showing at Sevilla, please call (904) 307-8998.